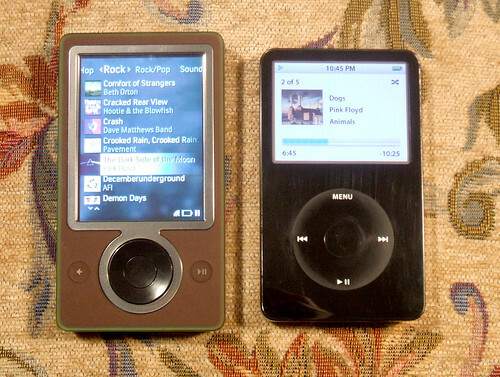 Zune v iPod: one survived, one failed. What’s the lesson to be drawn? Photo by Jim Thompson on Flickr. A selection of 12 links for you. Where the streets have no name but have got a single letter and four-digit number. I’m @charlesarthur on Twitter. Observations and links welcome. The three-in-one PC debuted in February 2016, built around Microsoft’s Continuum. El Reg’s lab vultures tested the kit and were impressed but found constraints caused by the Continuum operating system. Despite an obvious mobile-shaped hole in a leaked Windows roadmap, HP Inc insisted in August that it was committed to Continuum and so was Microsoft. Until now, that is. Nick Lazaridis, EMEA boss at HP Inc, told The Register at the Canalys Channels Forum in Venice that Microsoft had confirmed there will be no further development work on the mobile OS. “Microsoft, as all companies do, decided on a change in strategy and so they are less focused on what they thought they would be focused on today,” he said. Of course, HP used to have so many operating systems it was hard to choose between them; webOS was only the most recent. This [closure of Microsoft’s Groove music service by the end of the year] brings to an end a long story of Microsoft in the music distribution business. It started nearly 15 years ago with technologies in Windows that allowed for purchase and playback of various media formats. Microsoft sought to enable a large number of music retailers to market music through its formats and DRM and transaction clearing. Why? Because – as I found when I wrote “Digital Wars” – the modular approach to music players (someone makes the music player, someone else makes the DRM-enforcing software, someone else again offers the DRM-encoded music) produces an awful customer experience. If a problem arises, you’re never quite sure whose fault it is, and nor are any of those in the chain; they all hand it off to someone else. the long arc of history shows how hard it is to succeed in vertical integration after you build on horizontal foundations. Generations of managers graduated from the modular school of thought, specializing rather than generalizing. Now they are facing an integrated experiential world where progress depends on wrapping the mind around very broad systems problems. Case in point, we caught this malvertising incident on MSN.com, the Microsoft web portal that attracts millions of unique visitors. While clicking on a story promoted by Taboola – a leading global discovery platform which Microsoft signed a deal within 2016 – we were redirected to a tech support scam page. The warning claims that our computer has crashed and that we must call a number for immediate assistance. People think they’re clicking through to a story; instead they hit this crap. Google insists it has ambitious plans to create “compelling hardware products” and recently announced it would be hiring about 2,000 engineers from Taiwanese phone maker HTC to help achieve them. You can imagine future Pixels and other projects as part of that partnership (today’s is reportedly a partnership with LG). What’s less clear is whether Google has any significant changes in store to how the Pixel is marketed and sold. Because while its first version was critically acclaimed for both its hardware and software, it has not made much of a dent in the U.S. smartphone market after launching last October. An average 0.7% of U.S. smartphone subscribers used the Pixel in the three month period ending in August, according to data from measurement company comScore. For context: Apple’s iPhone is used by 45.5% of subscribers, and Samsung phones — the dominant company using Google Android to power its devices — represents 29.5% of U.S. subscriber share. More broadly, 53% of U.S. smartphone subscribers use Android phones. ComScore stopped giving out detailed data when the smartphone installed base seemed to have levelled off at about 200m total in use. So 0.7% would translate to 1.4m phones in use. (Versus about 91m iPhones and 59m Samsung phones.) There are twice as many Blackberry and Windows Phone devices combined in use than Pixel phones. So it really is going to be quite the question on how big a commitment it has made to the manufacturing side. Great products are only the beginning of the road. Key phrase there: “without needing to go elsewhere.” Facebook never wants you to leave. It truly is Hotel California, and makes itself more like that every day. The data presented here is a catalog of the non-promoted organic reach of the posts on each of the alleged foreign influence ops pages, showing the “total shared to” and sum of interactions (FB “reactions” + “likes” + shares, and comments) for each of the individual posts. Data was obtained directly from Crowdtangle, a Facebook-owned social analytics service. c) Encourage users’ to be tracked through emotional sharing vectors – “likes,” “reactions,” and url shares – to monitor issue “wedges,” further segment audiences, and to identify “hot-button” issues and keywords around current events. In one case, one of the pages went overnight from 0 followers to between 70,000 and 200,000 followers. Either purchased, or bots. That’s a determined campaign. Hackers working for the Russian government stole details of how the US penetrates foreign computer networks and defends against cyberattacks after a National Security Agency contractor removed the highly classified material and put it on his home computer, according to multiple people with knowledge of the matter. The theft, which hasn’t been disclosed, is considered by experts to be one of the most significant security breaches in recent years. It offers a rare glimpse into how the intelligence community thinks Russian intelligence exploits a widely available commercial software product to spy on the US. Aha. So this is why the US government has tacitly – well, perhaps not so tacitly – declared cyberwar on Kaspersky: they think it is feeding stuff back to the Kremlin. Kaspersky denies it. Google News’ statement claims that these false reports landed on the service’s “Top Stories” feed due to a burst of activity for a name that had never received many search attempts. “When the fresh 4chan story broke, it triggered Top Stories, which unfortunately led to this inaccurate result,” the statement reads. Twitter, Facebook and Google sort of got on top (mostly) of standard spam. Now they need to consider how to get on top of information spam. The Timestamps list includes the URLs and date and time difference compared to the current page for the following page elements: images, scripts, CSS and frames. Elements are presented in a descending order. If you put your cursor over a list element on the page, it will be highlighted and if you click on it you will be shown a playback of just that element. It’s easy to underestimate how valuable the Internet Archive is. If you’re doing any sort of serious research about events from the recent past – say up to 10 years ago online – it’s essential. Linkrot is real, but the Archive is the perfect preserver. Apple recommends that you take these steps to guard the security of your data. Encrypted APFS volumes that you created using any other method are not affected. This is quite a bug to have slipped through the QA process. Morale among militants in the Hawija area appears to be deteriorating rapidly. At least 600 men identified by Kurdish forces as Islamic State fighters have surrendered to the Kurds in Dibis, in Kirkuk Province. An additional 400 to 500 are being interrogated on suspicion of being militants. Together, they represent a substantial portion of the estimated 2,000 to 3,000 Islamic State fighters who were in the Hawija area before Iraq began military operations there on Sept. 21. As in other battles over the past three years, Iraqi forces have been supported in Hawija by American military advisers, forward air controllers, special operations troops, airstrikes and artillery. Col. Ryan Dillon, the spokesman for the United States-led coalition in Baghdad, said Thursday that the United States had conducted 16 airstrikes in the past week in support of the Hawija operation. The speed of what seems to have been a two-week Iraqi military sweep through Hawija suggests that the militants are no longer able to sustain effective military operations for long periods. A brief spasm – three years – approaches its end. Saudi Arabia’s 300MW solar tender has seen opening bids go lower than two US cents [per kWh], setting the tone for a new global solar power tariff record if awarded. Abu Dhabi Future Energy Company (Masdar) bid for 300MW capacity at SAR0.0669736/kWh (US$1.786 cents). During a webinar showing the bid opening ceremony, Saudi Arabia’s new Renewable Energy Project Development Office (REPDO) revealed the eight companies that had made it through to this stage, having had 27 companies shortlisted originally in April. REPDO then announced that these bids will be evaluated for compliance with the requirements of the RfP and a final shortlist of bidders will be announced on 28 November. The project will be awarded to the winning consortium on 27 January 2018, backed by a 25-year power purchase agreement (PPA). The financial closing date will be 28 February 2018 and the commissioning date is expected during 2019. This is a very low LCOE [levelised cost of energy]. Solar already comes pretty low on this cost. It’s getting cheaper.